I'm referring to Wine-colored dye, of course. This dye job has been intense! 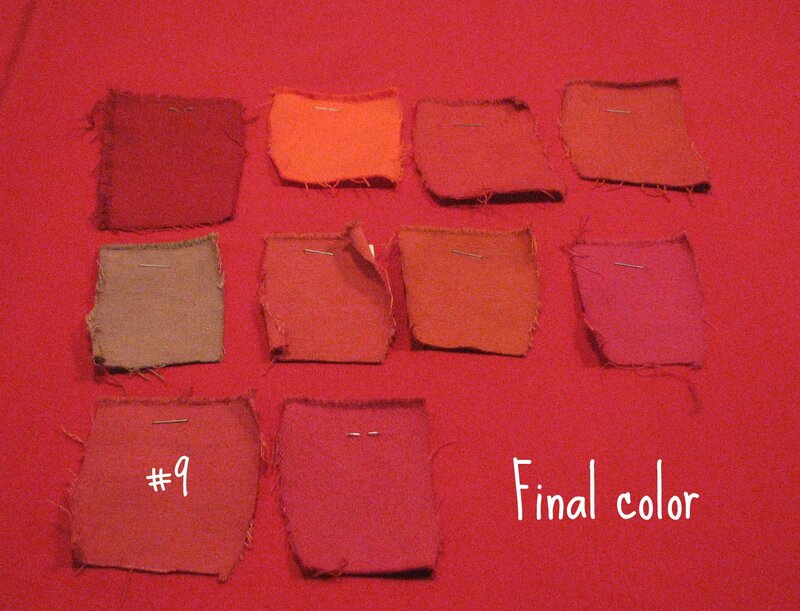 Saturday morning I was gung ho to convert the pink mistake to the perfect color denim. The Rit site gives formulas for a few hundred hues, and I aimed to emulate "Nantucket Red". The formula for my selection was 1 part Cherry Red to 4 parts Tangerine. Going for a lighter shade of 566. Unfortunately, my local source for dye did not stock Cherry Red (surprise). So I substituted Wine and brought in some Tan for muting (the Bubble Gum and Tangerine seemed so bright). The first sample I mixed proved the Wine was so strong that it overpowered the Tangerine (and looked a lot like Raspberry). It took 10 samples. I love potion number 9! After several test swatches, I narrowed it down to three choices and settled on #9 -- it was a bit more on the "rust" side than what I initially thought I wanted -- but I really liked it nonetheless. So I calculated the perfect combination of dye for 3 yards of fabric (compared to a 2-inch square piece), and mixed it up in my sink on Sunday. After 5 minutes, it looked like a giant piece of raspberry fruit roll-up. I was horrified. So I ran it through the washing machine with a cup of bleach, and it came out orange -- Carrot Orange -- which was not what I wanted either. I tried "color remover" and it looked exactly the same, still Carrot. I wasn't giving up! I soaked it in pure Scarlet. It was still Carrot, how can that be? Around 10:30 Sunday night, my husband patted me on the back and told me "You gave it your best try." 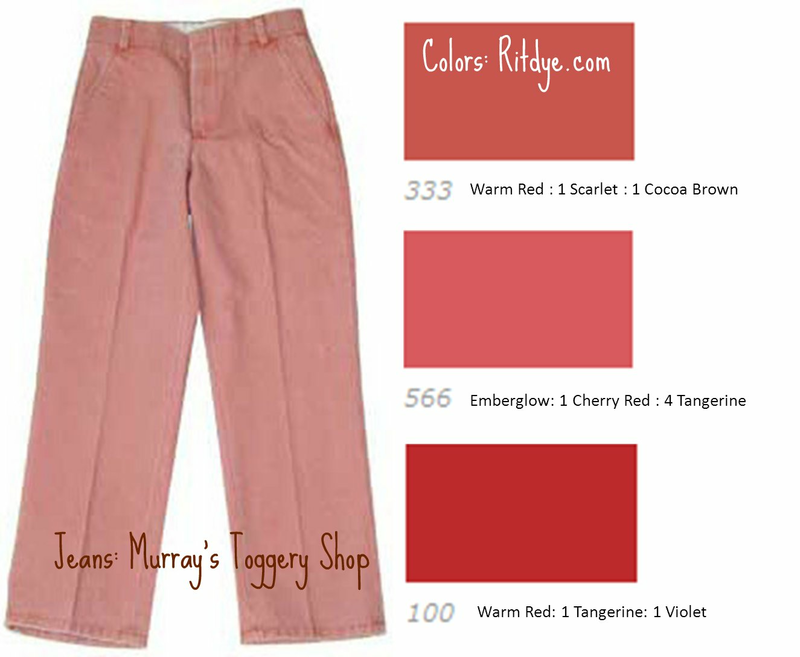 I wished I had just ordered some pants from Murray's Toggery Shop for $72.50 plus shipping and enjoyed my weekend instead. Why did the formula not work on a larger scale? Today when I came home from lunch and saw the wrinkled pile of Carrot, I gave it one more try. I mixed Scarlet with Wine and soaked it in the sink for the afternoon. It came out really red -- Tomato Red -- but it's a nice red, and I'd rather have Tomato pants than Bubble Gum pants or Carrot pants. It's still not #9, but that's fine. So I washed it and dried it and ironed it and started cutting out my pants...except that I am about 3 inches short of fabric for the pants! What?! 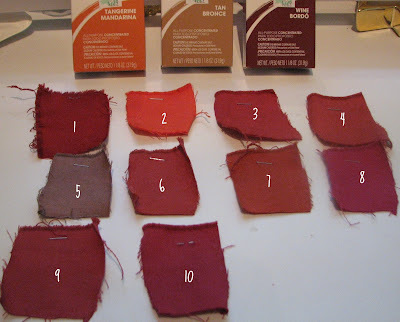 Did I shrink it that much during the several hot dye baths and washes? I've seen this movie before, and it's getting old. So maybe I will make some shorts, instead. Either way, I'm having some wine. It's quite possible for it to shrink from all the hot water and washing. Maybe you could still do pants, but cut all the non-visible pieces (like facings and pocket insides) out of something else? Shorts are also a great idea; i feel less ridiculous in crazy colored shorts than pants. Ironically, I would have had exactly enough fabric if I had cut the swatches for the dye test out of a different area of the fabric! So I have enough for capri pants. I also had the same thought that I may feel ridiculus wearing pants that bright!